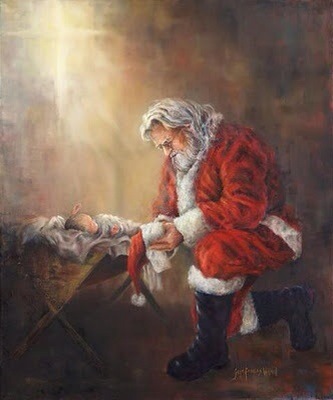 I have always like the poster of “Santa” kneeling beside the crib of Jesus. I raised my son to know both stories of Christmas, and why there is a celebration. They put ‘straw’ in the crib for the good deeds they did before Christmas, to show Santa they were ‘good boys’ and to prepare a soft place for Jesus to be born.